In a small saucepan, combine sugar, juice and cornstarch. Cook, stirring constantly for 2-3 minutes, or until sauce is thick. Remove from heat and place in airtight container. Refrigerate for 3 hours. 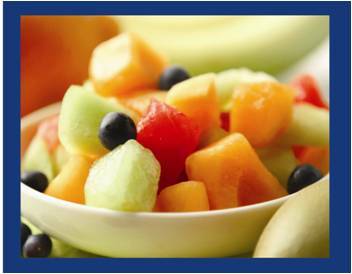 In a large bowl, combine fruit and pour glaze over fresh fruit. Toss and serve. Refrigerate leftovers in an airtight container.